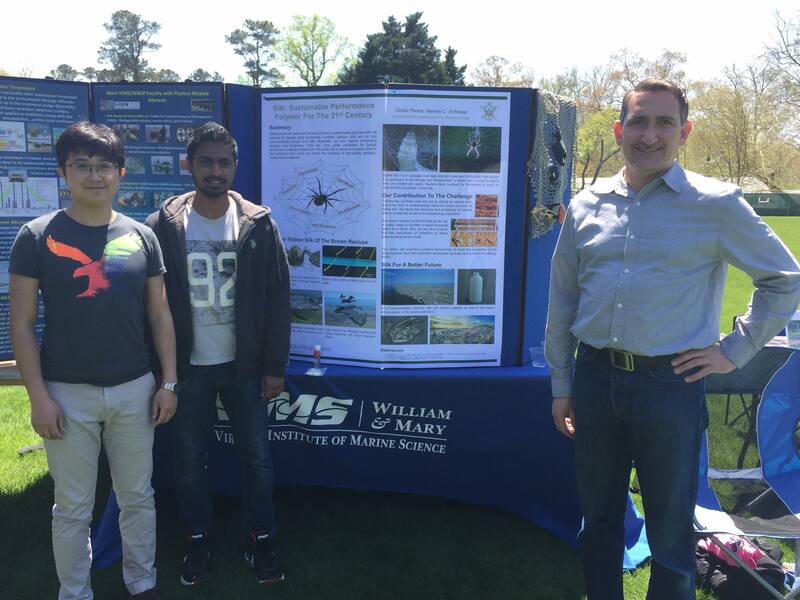 Professor Hannes Schniepp’s group has presented a poster at William & Mary Earth Day on April 21st 2018. The poster was titled ‘Silk: Sustainable Performance Polymer for the 21st Century’. Earth Week at William & Mary included a series of events and workshops leading to the Earth Day Festival held on Sat, April 21. The purpose of ‘Earth Week’ was to promote the idea of sustainability among the campus community. The poster was displayed at the Saddler Center Lobby until it was presented at the Earth Day festival. The poster highlighted the ability of silk to replace the plastics and reduce the accumulation of these non-degradable polymers in the oceans and land. The environmental pollution due to plastic accumulation has already become a severe problem that needs to be addressed as soon as possible. Silk, on the other hand, is a perfect candidate to replace these plastics because it is biodegradable and fully recyclable. Also, its superior mechanical properties such as high strength and high toughness combined with its light weight, make it a high-performance biopolymer for the 21st century. The main barrier to achieve this goal is the lack of understanding of the silk’s structure. Professor Schniepp’s group is trying to reveal the basic structures of silk in nano-scale by using high-end instruments such as atomic force microscopy (AFM), scanning electron microscopy (SEM), etc. The ultimate goal of this mission is to find out the actual structure of silk and how it is made in the natural environment and use this knowledge to manufacture synthetic silk with equal or enhanced properties compared to natural silk.